Encourage deeper, more meaningful learning experiences. Leverage ePortfolios to promote intentional learning, monitor progress over time, and enrich the student experience. ePortfolios give students many ways to deepen their learning. They can track their progress across experiences and over time, reflect on what they’ve learned, showcase their accomplishments, and easily share their work with others. Use ePortfolios to customize assessments for co-curricular, Gen Ed, and other campus-wide initiatives. Create interactive portfolios around specific program objectives to enrich student learning and assess program effectiveness. Promote holistic learning experiences on and off campus. 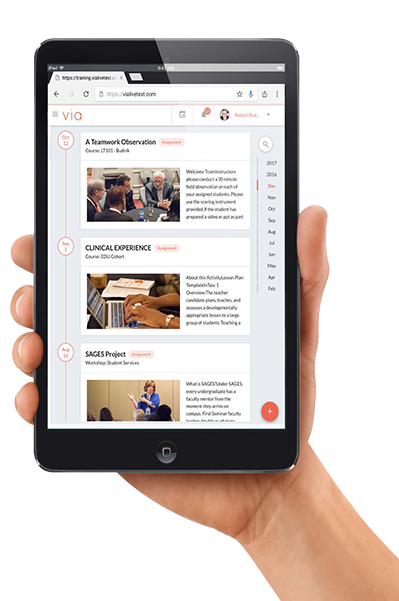 Using flexible ePortfolio tools, you can manage clinical practice, candidate placements, internships, and onsite assignments more effectively in one place. Enable all learners on campus to grow, reflect, and improve. Ease the burden on faculty scoring student work while collecting data for course, program, and Gen Ed assessment. Using our ePortfolios, faculty can align rubrics with assignments, provide formative and summative feedback to students, and generate reports to analyze student achievement. Customizable reports let you pull the data you need to monitor, analyze, and document student performance over time. This gives you a better way to measure progress on learning outcomes and inform decisions for program improvements. Capture hard-to-reach data and indirect assessments, examine student views of instructor and program effectiveness, personalize student feedback, and enhance candidate reviews with built-in survey tools that are easy to use. Support the student lifecycle from admission to graduation with a centralized system that gives you access to the data you need. From one convenient location, you can manage admissions applications, key assessments, and transition points more efficiently. Analyze program and course effectiveness to improve learning. Assess program, general education, and institutional learning outcomes. Manage high-stakes assessments and prepare candidates for the edTPA®. Collect the data you need for course, program, and Gen Ed assessment. Centralize faculty credentials, tenure track, and employment status data. 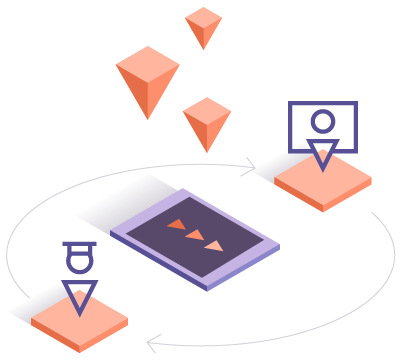 Streamline workflows with Single Sign-On and automated data collection. Customize surveys to capture student views of course and program quality. 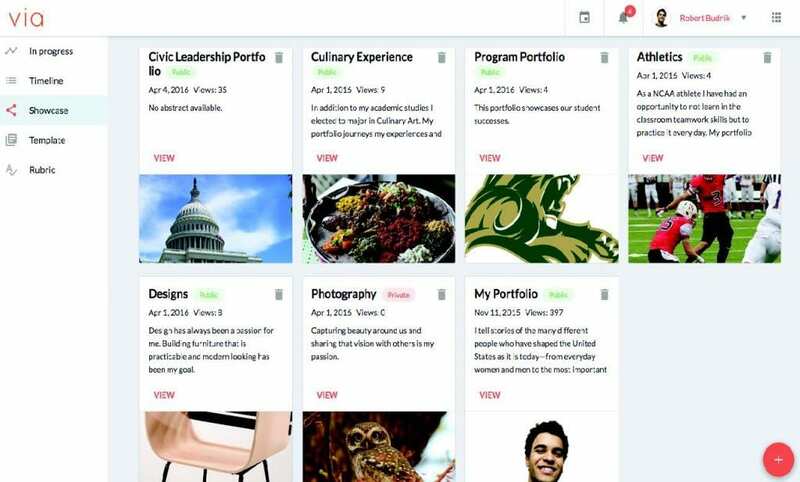 Leverage customizable ePortfolios in your courses and programs to enrich the student experience and assess learning over time. 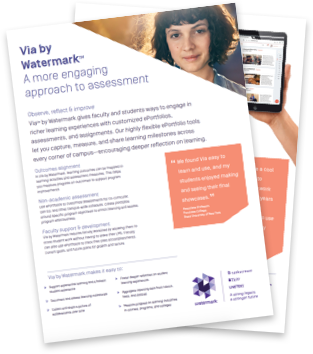 Download the flyer to learn how you can take a more engaging approach to assessment. "Our paper-based portfolio projects were impressive and full of rich content, but no one would ever know. 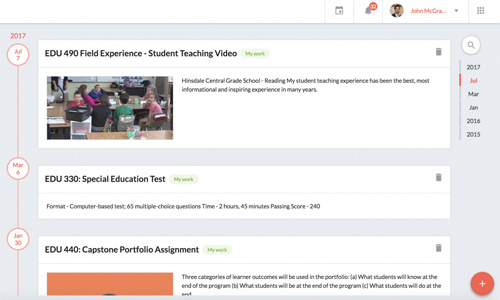 So we decided to use LiveText by Watermark ePortfolios to house valuable assessment data and help students develop themselves professionally." Fill out this form for a live demo. Make course evaluations and institutional surveys easy to create, report, analyze and share—within campus systems like your LMS, and with students, instructors, and administrators.